A woman has been cleared of causing death by dangerous driving after her car collided with a train on a miniature railway, killing the driver. 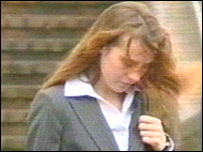 Marie Scrace, 23, was found not guilty at Maidstone Crown Court following the accident on the Romney, Hythe and Dymchurch Light Railway in August 2003. Train driver Kevin Crouch, 31, of south east London, was crushed to death. Mrs Scrace, of Lydd, admitted careless driving, was disqualified from driving for 12 months and was fined £500. After the hearing, the train driver's brother, Nigel Crouch, said the fine was "pitiful". His mother, Margaret Crouch, said: "I've got lovely memories of my son. "He was a wonderful son. He was kind, conscientious in his job and I miss him terribly." Maidstone Crown Court heard how the train had been travelling at 10mph when Mrs Scrace drove on to the railway. The locomotive, which had 100 passengers on board, hit the back of the car. Twenty passengers suffered minor injuries in the incident and Mrs Scrace and her 13-month-old son, who was in the car, had cuts and bruises. The prosecution said Mrs Scrace had driven on to the level crossing, which does not have barriers, because she had not seen the warning lights.